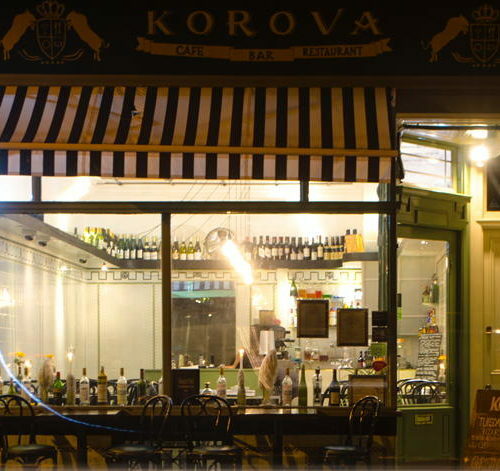 Korova means cow in Russian and is perhaps a reference to the butcher who used to have his shop where this award winning family restaurant now stands in the heart of Tufnell Park. The menu comprises the best locally sourced seasonal produce which chef and owner Steve transforms into fresh contemporary dishes. His wife Sital is front of house. As the menu changes regularly, you will find something new each time you visit but there are always meat, fish and vegetarian options and Steve is happy to tweak certain dishes for vegans too. The bijou bar serves classic cocktails as well as some innovative special creations by Korova. As well as serving dinner throughout the week Korova is open at the weekend for breakfast, brunch and lunch with the emphasis on a relaxed family atmosphere. And as always all their dishes are prepared with skill and served with love and charm!